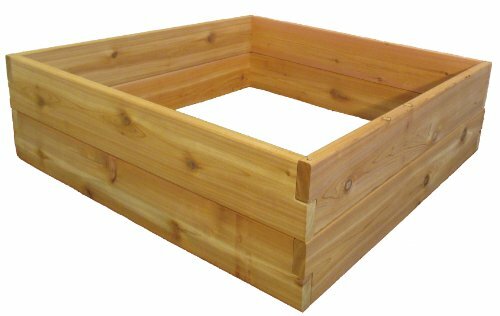 Made in the USA from Western Red Cedar, a durable and naturally rot-resistant wood, these raised beds are sturdy and easy to assemble. Raised bed corners are half-lapped, with rods going down through the assembly, which keeps the corners from working loose over time. It's easy to stack the boards to make raised beds in many different heights. Innovative Design: These beds are made from Western Red Cedar, a rot-resistant wood that can be painted or stained, or left unfinished to gray naturally. The simple design of these kits allow wood to shrink and swell, for better strength and durability in wet/dry conditions. Hardware like screws and nails eventually loosen as wood ages. Our beds assemble with rust-free aluminum metal pins set securely through the ends of each board. So after years of exposure the planter won't fall apart, and yet can be disassembled by hand if needed. No tools necessary. Assembly takes just minutes. Raised beds do not need to be finished. You can stain the outside of the boards if you want them to blend in with your patio or fencing design. Each height come with pins that are the same height as the bed, so you can put the bed on hard ground or a patio if needed, and the tops of the pins will be flush with the top of the bed. Raised garden beds help maximize harvests by efficient use of space. Raised beds are easy to set up, plant and maintain, producing high yields in a compact space with less digging and weeding. And now you'll find just the right size and shape bed for your needs. Use raised beds to grow vegetables, or install the beds along a perimeter to create stunning border gardens. You can even build a pyramid garden by stacking smaller beds atop larger ones.